I’m at a concert. At the back of the stage, groups of performers present show tunes, while at the front, ranks of players watch them in rapt concentration, completely still, but ready to spring into action when it’s their turn. The audience stands at the back of the hall and erupts into rowdy applause between each number, holding phones in the air to film the event for posterity. At the end of each group solo, with martial precision and discipline, each line proceeds forward, picks up the instruments and prepares to play. The nearly 90 performers are impeccably drilled and excited, but calm. This is not a stadium gig or a military tattoo. It’s 10.30am and I’m watching Year 2 of Gallions Primary School making its collective debut in the school’s Sports Hall. These six and seven year olds started learning their stringed instruments in September, and now, in March, they’re performing for their parents and teachers. The atmosphere is electric. This might not sound unusual for a private school, but Gallions is a state school in Newham, London, sitting in an estate that is in the 5 per cent most deprived areas in England. 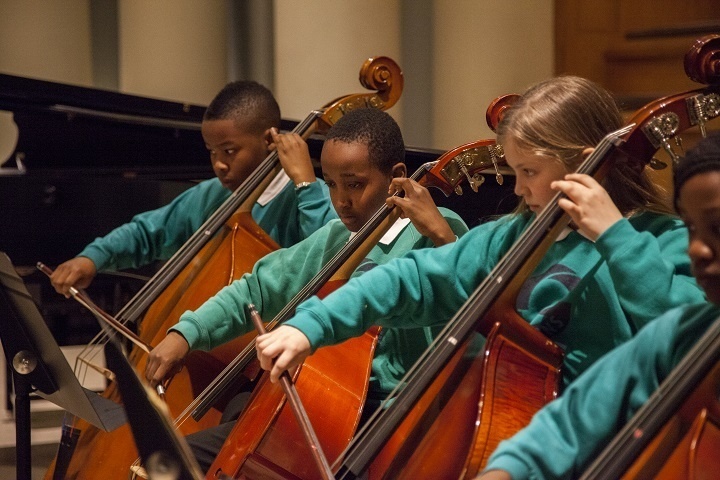 And this concert is not a one-off: Gallions students have performed at Royal Festival Hall, Birmingham Symphony Hall and Barbican Centre, among many other venues, and alongside world-famous musicians. Since it opened in 1999, music has been at the very heart of the school’s activities. From nursery and reception each child has a musicianship lesson every week and from Year 2 they are all taught a stringed instrument in small weekly classes. The result is engaged, attentive students. Musicianship classes are based on the Kodály system, so from the beginning, the children sing in solfége, complete with hand movements. I sit in on a Year 6 class where the students sing three-part canons, their hands casually moving up and down in front of them as if it’s automatic. They sit on the floor reading a tune in tas and tees and barely raise an eyebrow when the teacher introduces a harmonic minor scale for the first time, copying her perfectly. This is their normal. At one point, one boy won’t sit down properly, and there are little waves of fidgeting and chat, but generally the children are completely engaged and focused during the fast-paced 45-minute lesson. Instructions are sometimes sung and gestured (‘Please be qui-et’, ‘Please come and sit by the bo-ard’), and any telling off is gentle and reasonable (‘Remember not to talk while people are still singing’.) The children’s classroom teacher takes an active part in the class and keeps a watchful eye on behaviour. At the end of Year 1 the children choose their instruments, be it violin, viola, cello or double bass (I’m impressed to see so many tiny bass players in the concert, plucking the bass line of the can-can). Building on their Kodály musicianship, they use Colourstrings, the system devised by Hungarian pedagogue Géza Szilvay. The child-centred method develops technique, hearing, understanding and reading all at the same time, with the help of colourful cartoon teddy bears and stories. 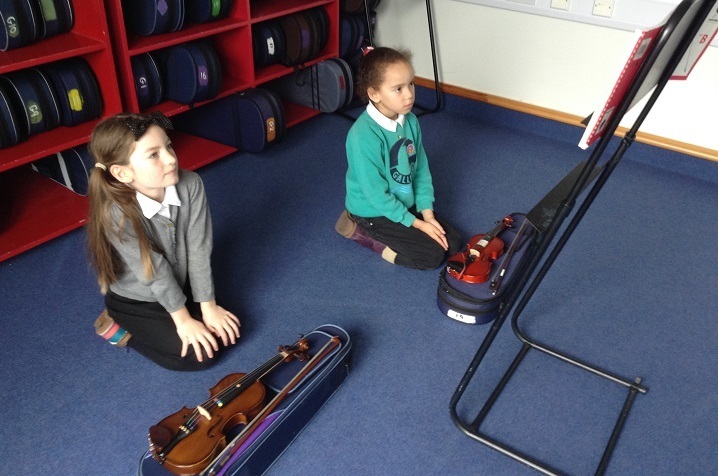 I visit a Year 3 violin class in which there are nine children, each with their own stand and a Colourstrings book, and two teachers guiding and prodding them. Faces are pursed in concentration as they read tunes together or take turns playing specific intervals. Some of them have perfect bow and instrument hold. Some don’t look so comfortable, and the teachers don’t always have the time to correct them individually, but you see the children watching each other, alert to all the information they can glean and trying to do well. 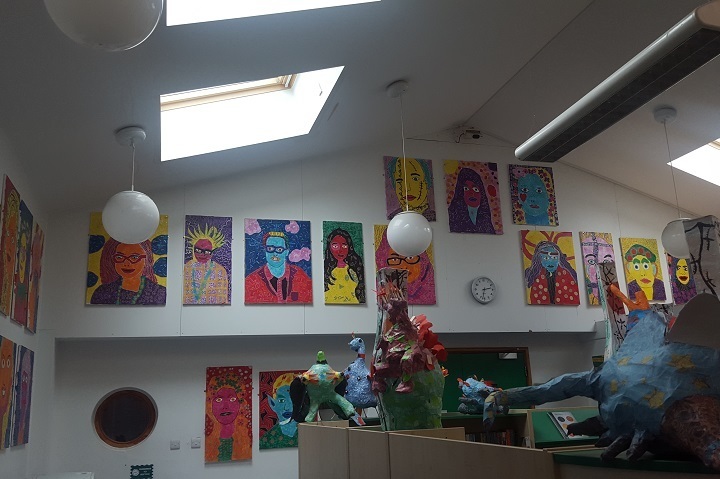 I am given a tour of the school by Ashley Roye, the school’s Music and Fundraising Manager, and down every corridor and round every corner is some sign of the school’s focus as a creative school, especially in the vibrant artwork made by the children with the school’s resident artist. They also have Philosophy classes and have a chess club. Of course, that doesn’t bear thinking about. Gallions has shown the way. In a landscape of targets, exams and shoestrings, it has demonstrated the benefits of a progressive and creative approach to education, specifically centred on music. Roye is keen to share the learnings and extends an invitation: ‘Get in touch. You need to come and see it for yourself. Nothing beats actually walking around this place, seeing the lessons. The magic is in the classrooms, watching the kids’ engagement.’ Having visited the school myself, I can certainly vouch for that. This feature first appeared in the May/June 2018 issue of ISM Music Journal.